The first time I watched Let the Right One In, I wondered if I was watching something that was going to go down as a classic. It certainly has the hallmarks: great script, performances of remarkable depth (especially from Lina Leandersson and Elif Ceylan, both of whom contributed to Eli), and themes that run relevant no matter what the era. Focusing on a severely bullied child and his relationship with a centuries-old vampire, we watch Oskar and Eli’s bond develop over the course of time into something pure and powerful. If you watch the setting, you’ll find that the progressions of light and the seasons mirror the emotional development and bond of these two characters. When we begin the story, it’s black. Snow is then introduced, but over half the screen remains shrouded in darkness. 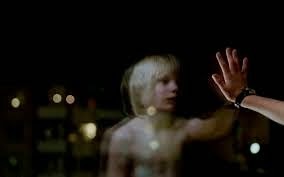 As Eli arrives at the apartment building for the first time, Oskar presses his hand to the window to touch his reflection. He’s clad only in his underwear, surrounded by darkness in his reflection. He then utters his first line: “Squeal like a pig.” Oskar is rehearsing revenge against his tormentors, though we’re not fully aware of this fact that this point of the film. We only see a nearly-naked boy attempting to connect to a blurred version of himself in the darkness. Reaching out to try to connect to anyone. This serves as a precursor to Oskar’s life at school. The next day, in a life before Eli, it’s overcast in the daytime. We see Oskar’s isolation and bullying firsthand. We know that he is alone. So when he meets Eli, it’s fitting that it’s nighttime: there’s not much hope; it’s dark; he’s alone; the only person that will talk to him is the smelly, dandruff-afflicted little girl that tries to make friends on a snow-covered jungle gym. It’s not the most auspicious circumstances for friendship. In fact, when Eli first observes Oskar, he’s stabbing a tree and rehersing his revenge against his schoolyard bullies. He’s hopeless and growing violent. He half-heartedly gives Eli his Rubik’s cube to solve, with the thought that he’ll receive it back withoutm much progress to it being solved in a few days. The tone doesn’t immediately change at this point for either Oskar or Eli. Oskar retreats to his bedroom and collects clippings of various crimes and murders. Eli, who is left starving after a botched attempt to obtain blood by Håkan, resorts to a dark underpass to obtain sustenence. It’s still bleak for them both: they’re still alone, and so the setting is still the black dead of winter. It’s when Eli solves and returns the Rubik’s cube that we see trees beginning to bud and sunshine peeking out. Their growing bond ushers in spring. It’s a rebirth for them both. Funny how this appears once they start to bond. That’s not to say that the light and seasons are uniformly bright and cheerful from here on out. This is still a movie concerning true horrors, after all. Oskar is confronted by his bullies again and whipped after school when it’s very dark outside, showing that he still has a way to go in his suffering as he learns to stand up for himself. While Oskar and Eli begin their morse code communication through walls, we see Oskar’s forest-clad walls as opposed to Eli’s cracked, barren walls, a stark contrast of Oskar’s emotional attachment and Eli’s bleak existence as a vampire. It’s nighttime when Oskar takes Eli out for chocolate, which leaves Eli sick. Interestingly enough, once Oskar leaves to visit his father, the setting is clear and bright, despite the snow. The escape and the freedom associated with it is reflected in the weather. It’s when his father’s friend (or lover, if you interpret it that way) shows up with alcohol that the world turns dark again. The reality of how broken the situation with his father is literally blackens Oskar’s world. Hitchhiking home in the middle of the night in the snow is a pretty extreme method of running away from the situation, yet that’s what we get. Oskar’s happiness is brief, as is the light. He returns to Eli to draw more strength. The light does stick around when Oskar finally stands up to Conny on a school trip. The action is violent and causes the loss of hearing in Conny; however, as an audience, we’re thrilled that Oskar stood up for himself. The day is cheerful and bright, with spring beginning its first flush. It’s also at this time that Jocke’s body is discovered. We’re still not entirely at that point of peace, but we’re making progress. The death intruding upon the sunshine demonstrates that while it’s not complete, there is definite progress to Oskar’s quality of life. Eli, on the other hand, continues to struggle. Eli requires the darkness due to the many secrets he possesses. Eli laps blood during a nighttime outing with Oskar; however, he sends Oskar away to avoid harming him. Also at nighttime, Eli confesses his vampiric nature as Oskar gets a glimpse into Eli’s past (including Eli’s missing male genitalia). It’s worth noting that as their bond grows, and Eli becomes more transparent, the sun shines brighter and the seasons progress further. This culminates when Eli kills Lacke rather than have him harm Oskar. Covered in blood, Eli wraps his arms around Oskar, who offers thanks. It’s significant that Oskar’s reluctance to kill Lacke and Eli’s defense of Oskar happens during the daytime. It’s their first daylight interaction, and it cements their intimacy. Eli’s subsequent flight away from the situation leaves Oskar devestated. We get the mirror image in the window again, along with a type of watery haze. We hope that Oskar isn’t as alone, and that his transformation has stuck. However, like a false spring, Oskar still has some growing to do, but he’s not going to do it alone. Oskar’s final confrontation with the bullies happens at night, in a pool. He’s isolated again at the start, but this time, he’s reborn with the help of Eli. The light in the pool appears brighter after Eli kills two of the bullies and Conny’s older brother Jimmy. Our final take away of them before they depart the pool: two equally bright, happy smiles. These two have pulled through a long, harsh winter and are ready for sunlight. A pair of bright eyes after a near-death experience. While we see the snow and darkness again, we liken it to a closing of life in Blackeberg. There is death, destruction and general unhappiness for Oskar and Eli there. The snow falls again, but this time, it takes up more of the screen. It’s not as pitch black; there’s more beauty to the pattern, more of a chance to see crystals and recognize flakes. We see the beauty of the darkness that we couldn’t see at the start of the film. In arguably the most touching scene of the film, we see bright sunshine streaming through the train windows at the very end as a singular Oscar watches the world go by. We hear quiet tapping from the trunk in his compartment, to which he answers in morse code. The word he spells out? “Puss,” which is Swedish for “small kiss.” They have an inside tradition that holds special meaning, they would do anything to protect each other, and they love each other very, very much. As an audience, we love that these two wound up together. What does this demonstrate to the weary audience that has followed them on this journey? Like the seasons, our problems will not disappear overnight. In fact, many problems will require confidence and outside help in order to fully come through them. It also shows us that damage, while it doesn’t go away, can make the right person love you no matter what. Just as we finally see the beauty in the snow in time for spring, Oskar and Eli accept each other no matter what. The loneliness and suffering of each does not matter anymore. Like the inevitability of the springtime, it too will pass out of the dark winter and into something better.